I'm not certain which I dread the most- my kids on a sugar high or my kids in the midst of a sugar crash. Craving a sweet treat is to be expected from kids and adults, observing our intake of sugary foods and candy helps in maintaining a healthy balance in our diets. Offering healthier options, the Lovely Candy Company has become a family favorite with their delicious Honey Gummy Fruit Bears, Honey Gummy Sour Bears, and melt-in-your mouth goodness, Dark Chocolate Honey Patties. Bringing fun and flavor, we had our first taste of healthy real honey sweet treats from Lovely Candy Company. Thank you to Lovely Candy Company and their promotional team for the courtesy of providing product for editorial content purposes. 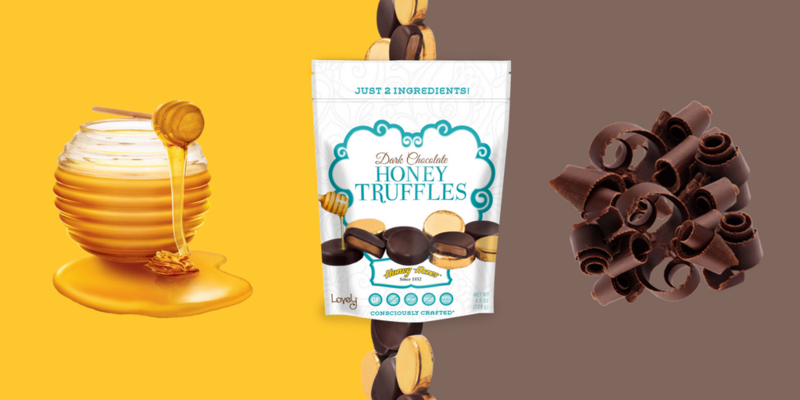 Providing customer with premium quality candy and treats which are gluten-free, and "consciously crafted" with no high fructose corn syrup, and no artificial colors or flavors, their Honey Gummies are the first gummy candy listing honey as its primary ingredient and made without gelatin and are peanut-free. Perfect for entertaining family and friends during the holidays or any time, Dark Chocolate Honey Patties from Lovely Candy Company are simply goodness, made simply with three ingredients- real honey, 99% cacao and a little bit of flavor (original, mint, or raspberry). These delicious patties contain no dairy, no artificial ingredients and are also gluten-free, and peanut free. Discover all of the delicious Lovely Candy Company confections today!